Congratulations! ?IWRP’s Ishita Aggarwal was awarded the Queen’s Young Leaders Award Programme Fellowship in June 2018 – here she is at Buckingham Palace with the Queen and other awardees from all over the globe! We welcome Georgia Coles who has just joined IWRP as our newest Research Assistant. She has a major in Global Development Studies and a minor in Women’s Studies from Queen’s University. Georgia has worked in Uganda and will be able to contribute to our work there as well as other research projects. Members of the Global Network of Women Peacebuilders meeting at the UN Commission on the Status of Women in March 2018. The IWRP was represented at CSW by Andrea Sobko and Susan Bazilli. Constitute! 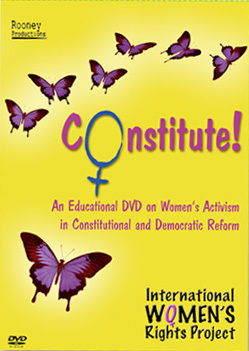 is a IWRP multi-media educational resource on citizen engagement and women’s constitutional activism. The website will allow you to view the film Constitute! as well as other interviews, and use the study guide and other educational resources in the classroom or for your own research. IWRP works to influence the implementation of international human rights standards through collaboration, participatory research and evidence-based advocacy.